Often we get so caught up in our new ideas that we forget to stop and ask ourselves if we are really solving a problem and if so, which problem. Head snugglers solve a problem. But it’s not for kids’ necks. (When have you ever heard about a toddler complaining about a stiff neck?) Head snugglers solves parents’ needs to feel like they are doing the most possible for their kids’ health and comfort. Many companies profit from that desire. 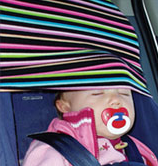 Needless to say, we will not be buying any head snugglers even though we often comment that the kids look really uncomfortable sleeping in the car! They always wake up just fine and able to flop their heads over to our shoulder to be carried into the house. If you have a problem, talk to the person! Next PostNext Libraries in Barcelona!